Baseball cards & boxes reviews and the life of a collector. Specializing in Topps Baseball and Lastings Milledge cards. Everything about this card is so pleasing to my eyes. Turkey Reds always are to me though. This was one of the last cards produced of Lastings in a Mets uniform, thank god, before we'd see him move on to Washington and then Pittsburgh. 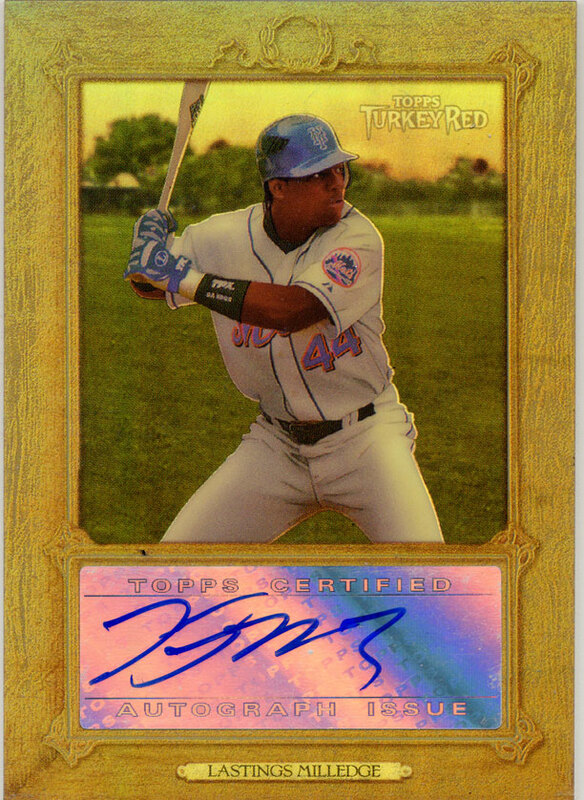 Its an on-card autograph and claims to be a refractor on the back of the card, where it tells me I've recieved an authentic Autograph card of Lastings Milledge from 2007 Topps Turkey Red Basball. Couldn't have gathered that from the front I guess... While the back lists the card as a refractor, the Topps official name for the set is Chromographs (strange bit of word play there. This particular set, the D group, was a 1:177 hobby packs pull from the 2007 Turkey Red Set. It books for $15 but I picked it up the other day on the bay for just $7. I am a graduate of the accounting program at Northeastern State University. I spent five years at the University of Oklahoma where my study focused on philosophy and history of science.